Contributed by Christina Gaydos. Christina is a Kent State Library and Information Science student, completing her Spring practicum before graduation in May 2016. 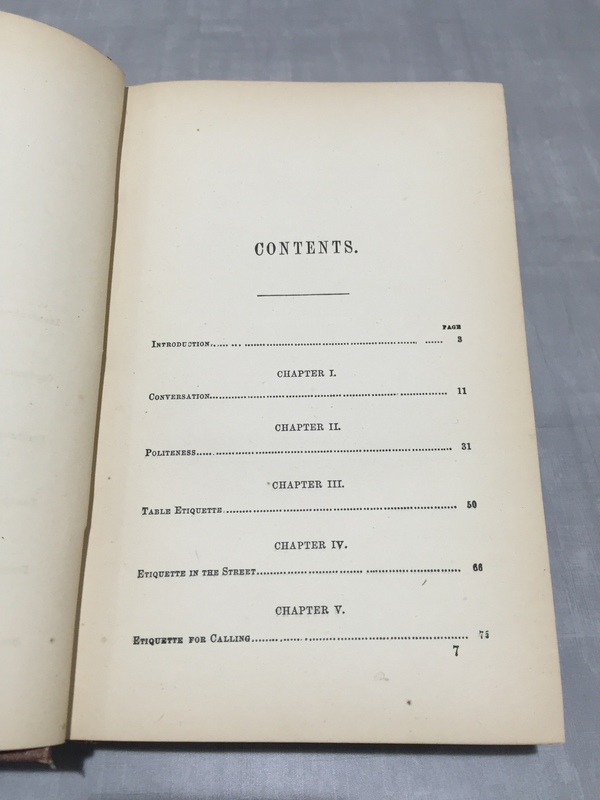 Christina is focusing on cataloging, assisting in cataloging print and manuscript collections, among other projects, including ContentDM. Etiquette. The customary code of polite behavior in society or among members of a particular profession or group. AKA Manners. For a two year old, two phrases that often appear in our tiny memory banks of phrases are “Please” and “Thank you”. Manners and polite behavior, generally, were instilled upon us by our parents at an early age, so that by adulthood, we could use these skills without thinking. This training is not new, and will–fingers crossed–continue into the future. A small price to pay for continued civility within our society, right? Now, take a step back in time with me. Manners and etiquette have not always been this cut and dry: Please and Thank you. Holding a door open. Inside voices. Sharing. Exchange of pleasantries. 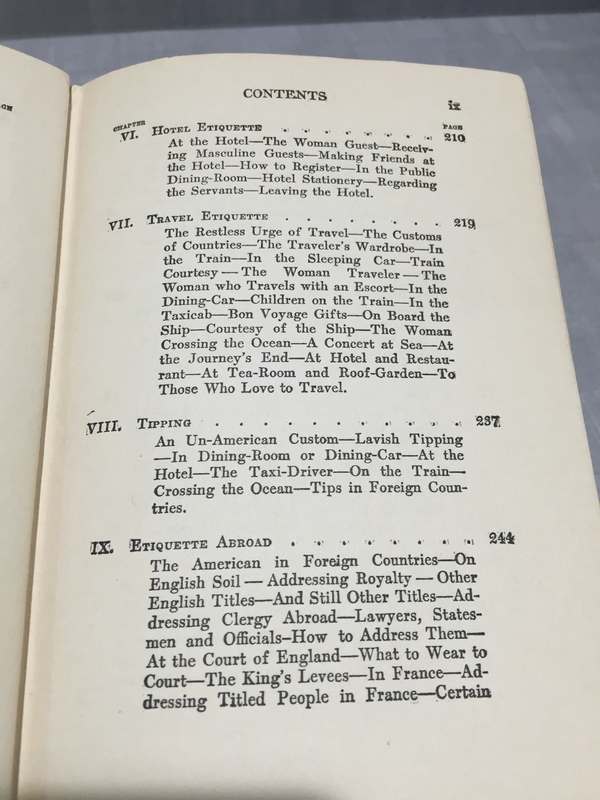 While cataloging a number of items from the CCHP print collection, I came across a large number of etiquette books for men, women and children. Etiquette books, really? 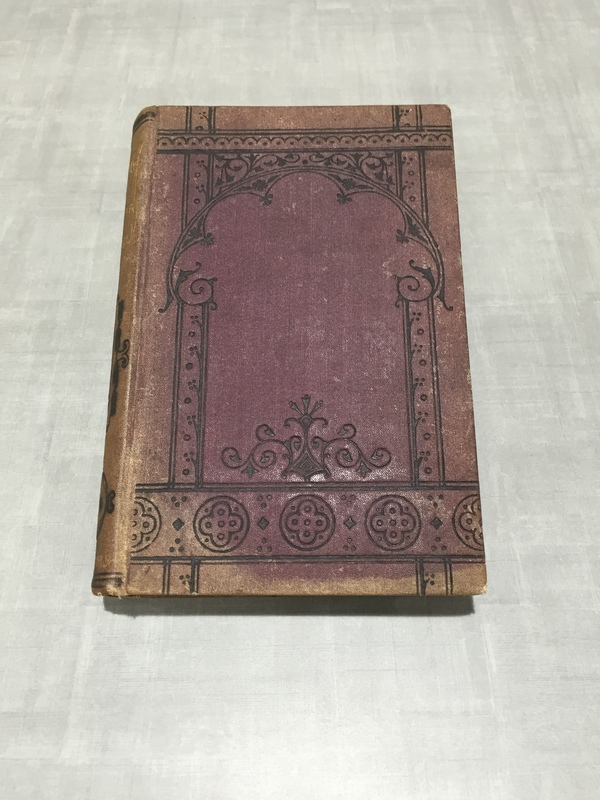 Flip one open and you will quickly see just how complex being a polite member of society would have been some 100 or so years ago! 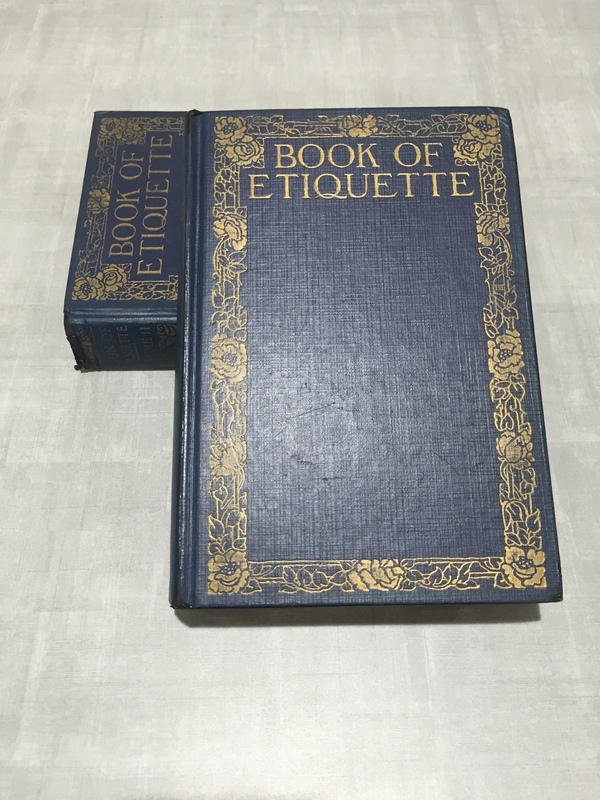 I am providing three interesting examples of etiquette books. 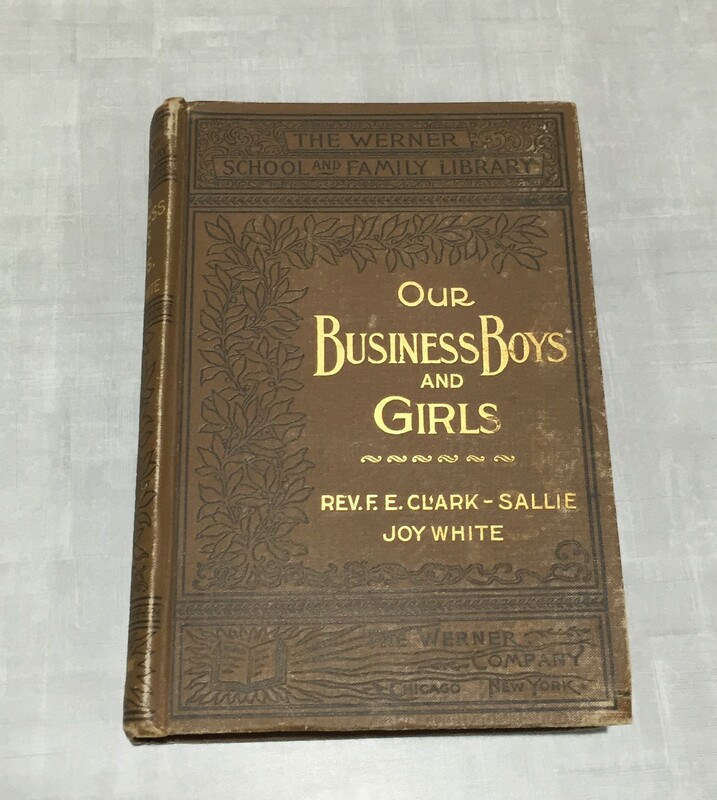 The first is solely for the polite gentlemen, the second an educational read for boys and girls, and the third for both men and women alike. 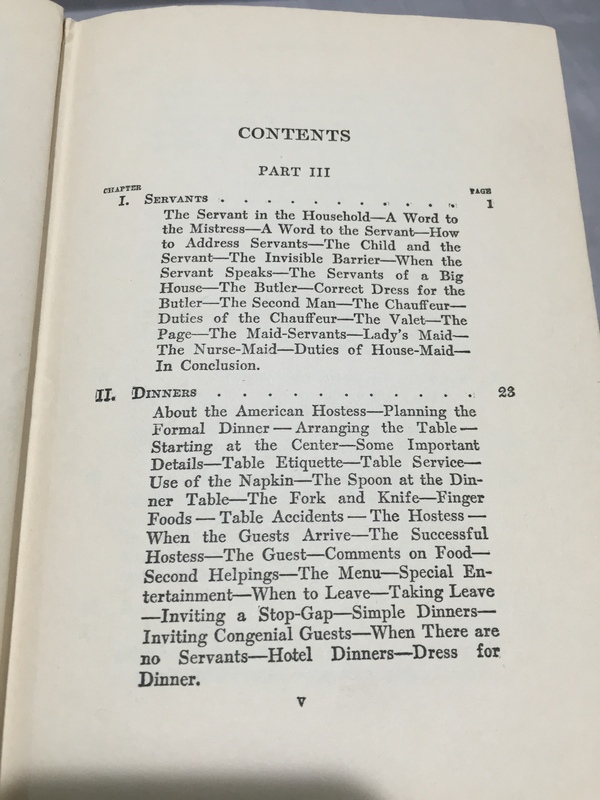 Be sure to look over the table of contents to see the many ways in which correct etiquette could be applied to your lives! Yes, this is the whole title! 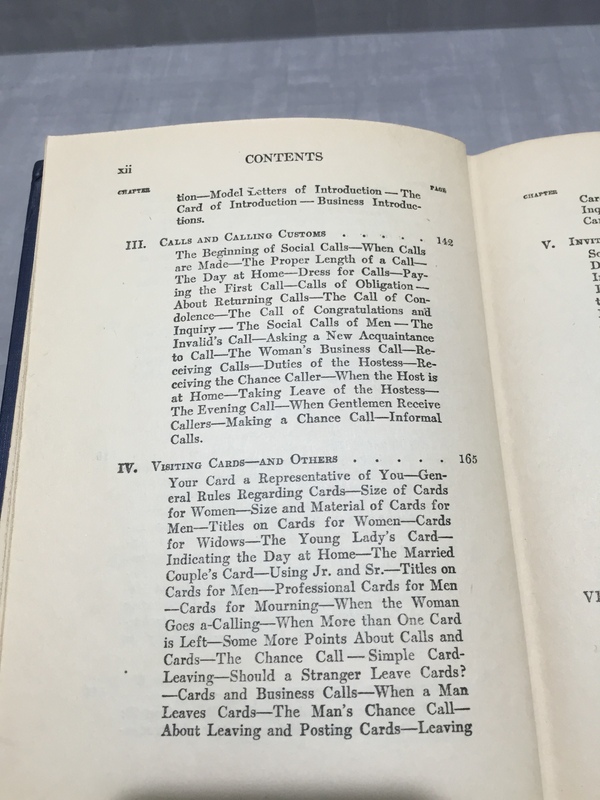 As the Introduction will so kindly point out, gentlemen in society must effortlessly be able to assess a situation and conduct themselves accordingly– “To make your politeness part of yourself, inseparable from every action, is the height of gentlemanly elegance and finish manner” (p.4). For those of you who are curious, “manly exercises” include maintaining one’s health through riding [horses], driving, boxing, sailing, hunting, skating and cricket. 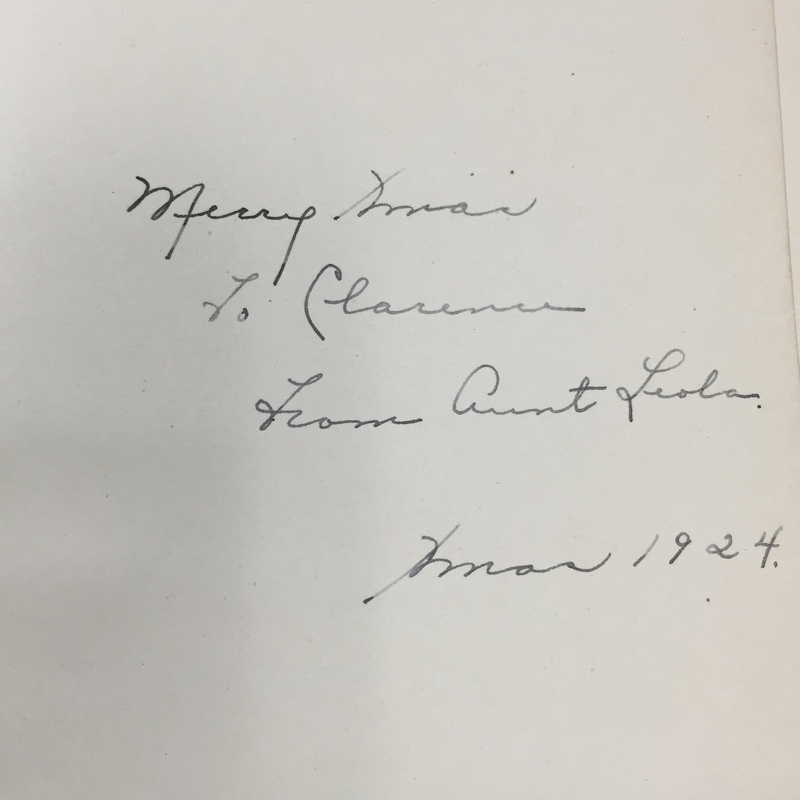 Composed of three booklets written in an “instructive and entertaining way” to educate children on proper etiquette, our particular copy was a Christmas present to a “Clarence” From Aunt Leola Xmas 1924. Cannot help but feel overwhelming disappointment at this Christmas gift—or was our little Clarence that much of a trouble maker? We will never know! 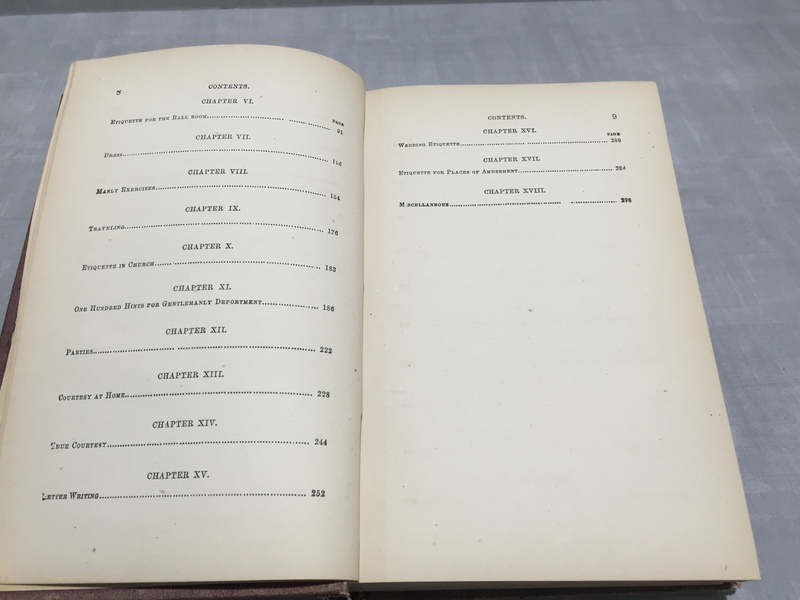 The first thing you will notice with these volumes is the extent to which they go into detail on every aspect of important doings in society. Seemingly endless ways to subdivide proper etiquette from Dress to Traveling, Weddings to Invitations. 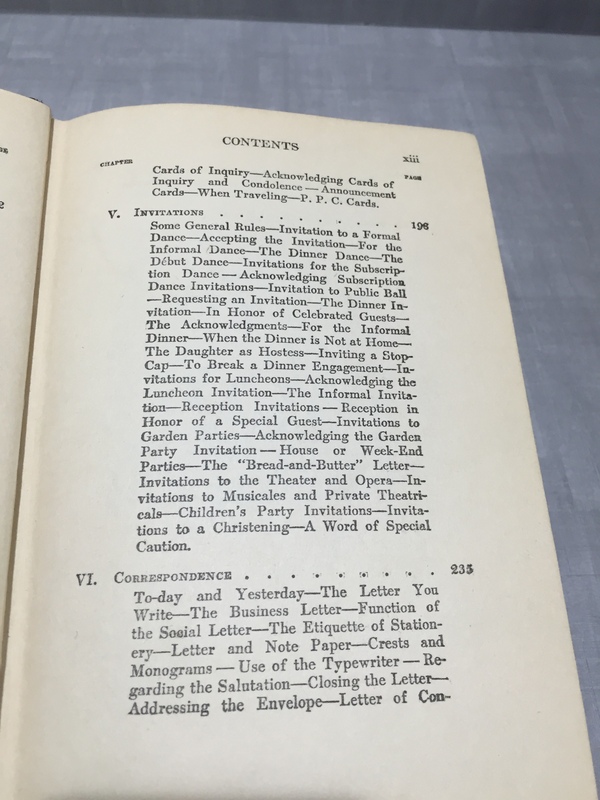 One of the authors actually notes how ridiculous some of the codes of etiquette have become. She uses the example of a gentlemen about to save a drowning man, but upon realizing he has not been formally introduced, he continues on– leaving the man to drown, happy to have avoid a social faux pas. 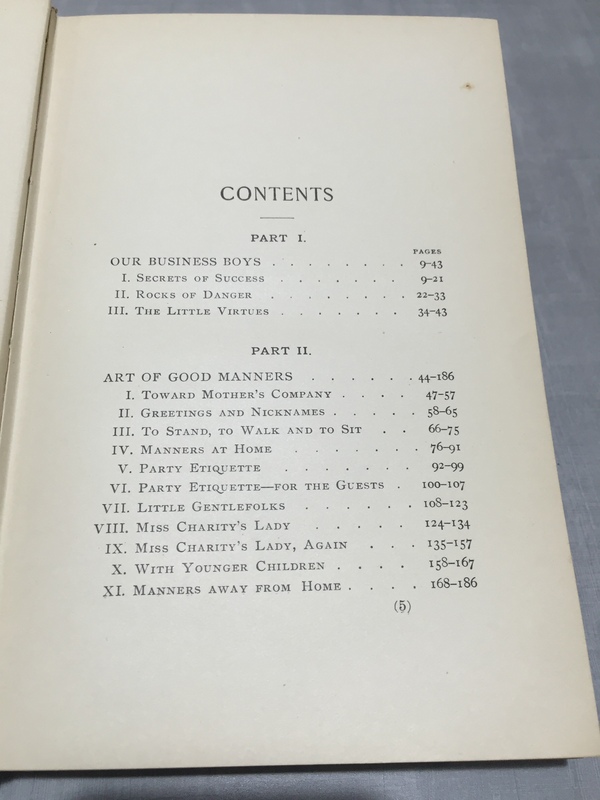 The overarching goal of etiquette in these volumes, was the same– good manners and etiquette are important because they improve everyone’s quality of life and create a more polite environment. A nod to all those lovely ladies on PBS’s Downton Abbey, I certainly would have given up a long time ago.